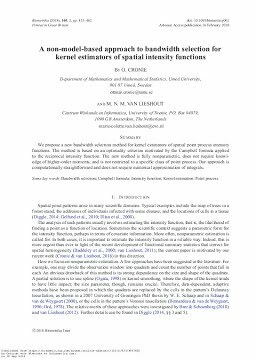 Centrum Wiskunde & Informatica: A non-model-based approach to bandwidth selection for kernel estimators of spatial intensity functions. A non-model-based approach to bandwidth selection for kernel estimators of spatial intensity functions. We propose a new bandwidth selection method for kernel estimators of spatial point process intensity functions. The method is based on an optimality criterion motivated by the Campbell formula applied to the reciprocal intensity function. The new method is fully nonparametric, does not require knowl- edge of higher-order moments, and is not restricted to a specific class of point process. Our approach is computationally straightforward and does not require numerical approximation of integrals.